“One Foot on the Shore...A Spiritual Journey to the Promised Land” from Christian Faith Publishing author Diana A. Blackmon is the story of a woman whose Faith has allowed her to touch the hearts of countless believers and un believers. Through her discovery of God, Diana A. Blackmon was able to overcome hardships to create Faith-inspired crafts that propelled her successful outreach to marketplaces across the country. 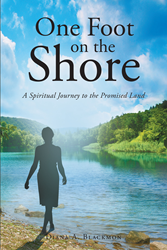 “One Foot on the Shore...A Spiritual Journey to the Promised Land”: the journey of a woman who used her craft and the inspiration of God to overcame hardship. “One Foot on the Shore...A Spiritual Journey to the Promised Land” is the creation of published author, Diana A. Blackmon. Diana is a devoted handmaiden of the Lord. An evangelist at heart, she witnesses with designs the Lord has inspired her to create. Through signs and her signature piece, the Gospel Pin™, she has told His story to millions of people around the world. Diana has an insatiable hunger for the Word of God. Coupling this hunger with her ability to visualize the Word, she ministers in places untouched by the gospel. To the lonely, she brings encouragement. To the rejected and downtrodden, she brings hope, acceptance, and the unconditional love of the Lord. Her love for people places her in marketplaces across the country. She resides in the heart of Carolina country where she has been happily married to her husband, Doug, for over forty years. They have two grown children, Gary and Amanda, who have given them three wonderful grandsons, Spencer, Kore’, and Cameron. Diana was touched by God’s gift of grace over thirty-three years ago when she accepted Jesus as her personal Savior. As a young mother, she faced hardship and separation that became a stepping-stone to a higher dimension of faith. She is one who understands the transforming power of God. Changed from inside out, Diana lives her life in victory through Christ. The pain of rejection has been overcome by the acceptance of the One who calls her His Beloved and His Chosen. Published by Christian Faith Publishing, Diana A. Blackmon’s new book is the real-life journey of a wife and mother from North Carolina to the Promised Land of the Lord. Author Blackmon’s story starts with a call that took her years to recognize. Once the Lord’s salvation became a reality for her, however, she was quickly overwhelmed by His supernatural grace. Obedience became the hallmark of her existence. By spending hours praying and studying God’s Word, she reaped many seen and unseen rewards. “Obedience is better than sacrifice” became a reoccurring theme throughout her life as she followed Him and His guidance. Through her obedience to the Lord, she has reached multitudes with the Gospel of Jesus Christ and her anointed jewelry designs, including her signature piece, the Gospel Pin™. This piece and many of her other Christian jewelry designs were featured on the QVC Shopping Network for many years. As she shared her heart with her southern drawl on QVC, many millions were blessed to hear the gospel shared in such a unique way. It certainly was not an easy journey. Laugh and cry with her as she stumbled through the Red Sea ruts to conquer the giants in the land. View a synopsis of “One Foot on the Shore...A Spiritual Journey to the Promised Land” on YouTube. Consumers can purchase “One Foot on the Shore...A Spiritual Journey to the Promised Land” at traditional brick & mortar bookstores, or online at Amazon.com, Apple iTunes store, or Barnes and Noble. For additional information or inquiries about “One Foot on the Shore...A Spiritual Journey to the Promised Land”, contact the Christian Faith Publishing media department at 866-554-0919.